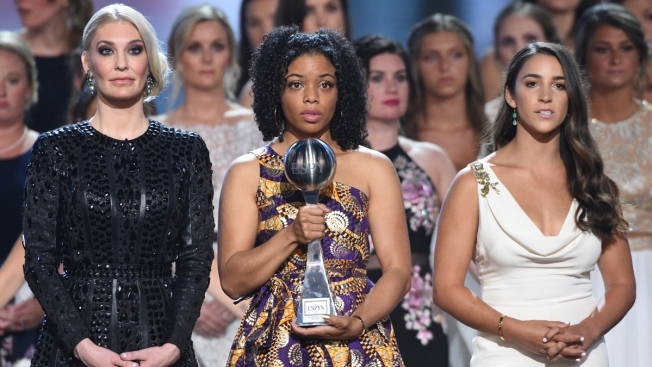 Sarah Klein, from left, former Michigan State University softball player Tiffany Thomas Lopez and gymnast Aly Raisman accept the Arthur Ashe award for courage at the ESPY Awards at the Microsoft Theater on Wednesday, July 18, 2018, in Los Angeles. 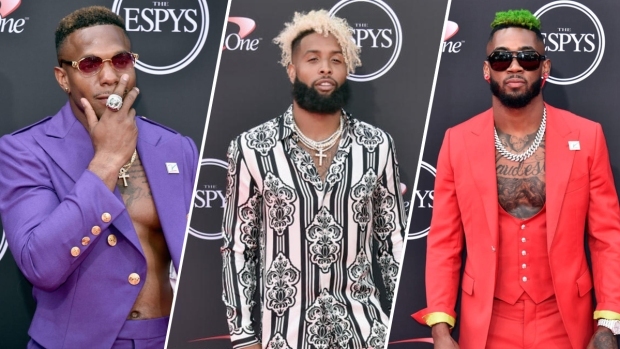 Over 140 survivors of sexual abuse by Larry Nassar received the Arthur Ashe Award for Courage at the ESPYs Wednesday. Olympic snowboarding champion Chloe Kim won best female athlete, while Alex Ovechkin claimed best male athlete. The best coach award was posthumously given to Aaron Feis, Scott Beigel and Chris Hixon, all of whom died in the Parkland school shooting.